Before I turn it over to the cats, here’s an update from me, their loyal human. 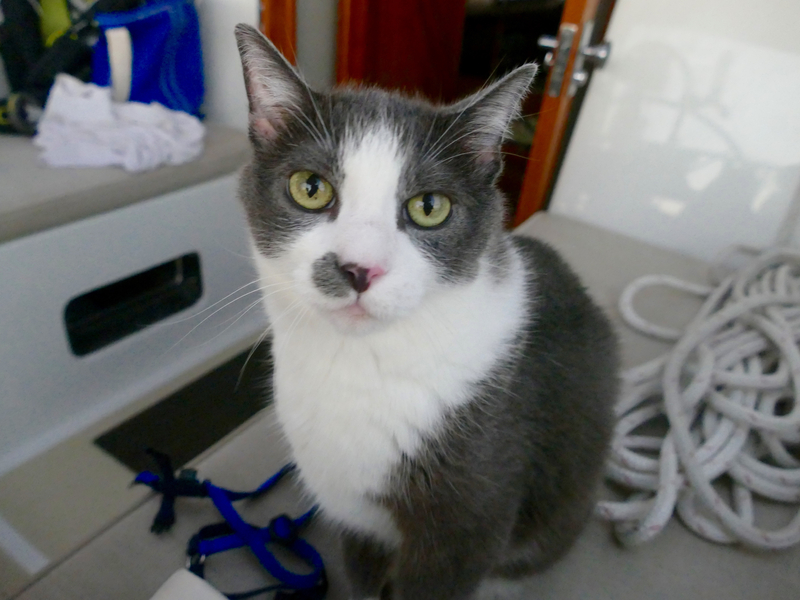 Lots of people have asked us, “How are the cats doing?” The short answer is, they are great and love their new life afloat. 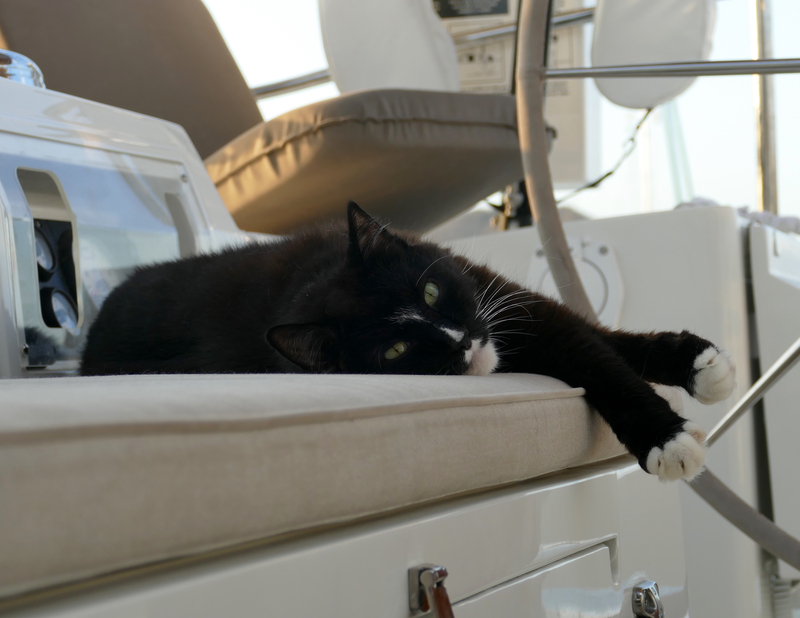 If you’re curious how a couple of 11-year-old cats have adjusted to life on a sailboat, read on. Chase and Guinny love having us by their side 24-7. 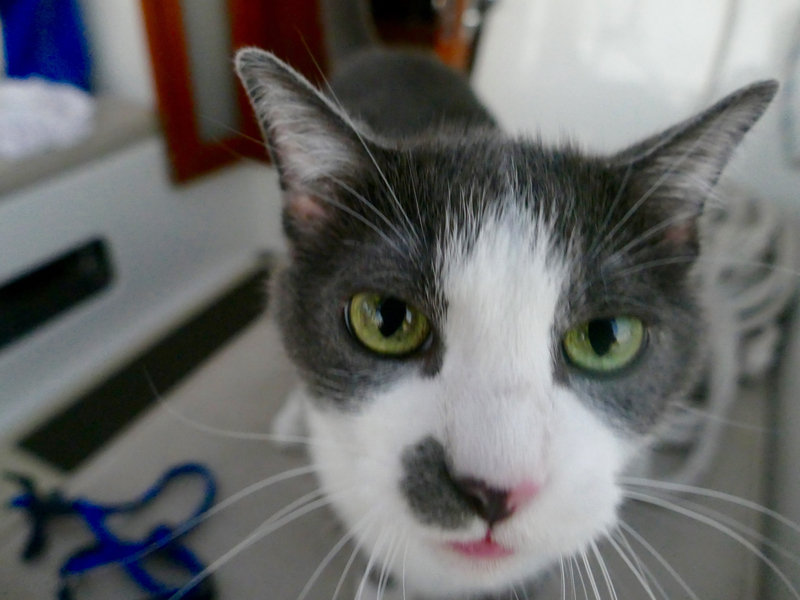 If you’ve met our cats, you know they are super social and even, you might say, super needy for attention. 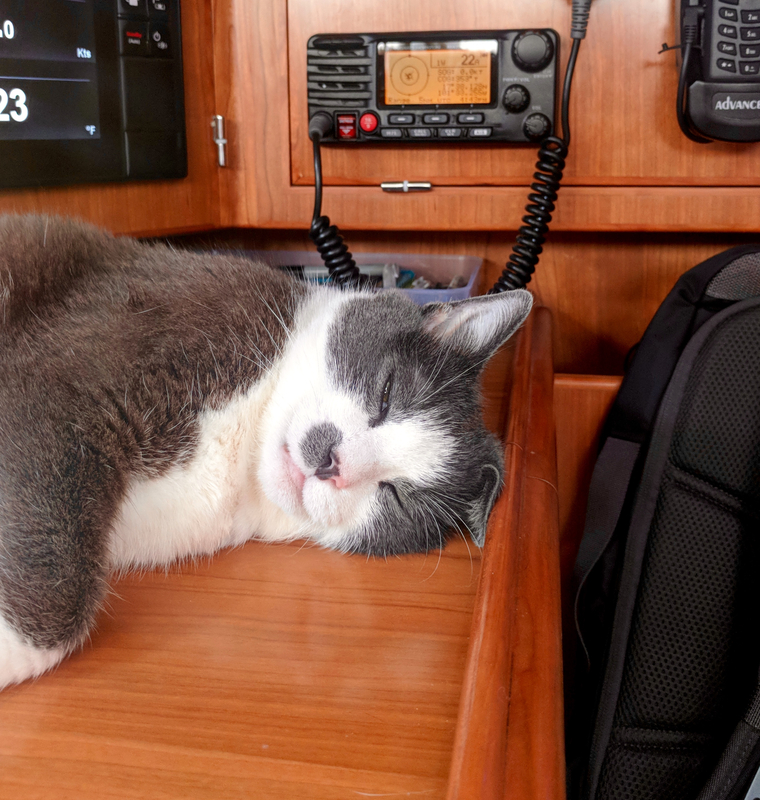 But we are together so much that sometimes I think they like it when we leave the boat during the day so we’re not interfering with their daytime naps. Cats need their alone time too, I guess. We are not worried at all about them going overboard. 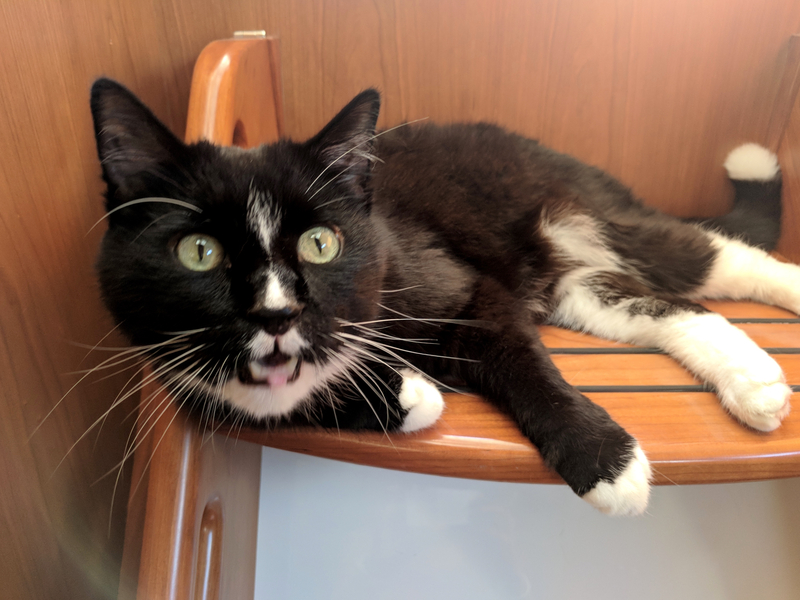 Our senior cats are not as adventurous as they once were, and I’d like to think they are pretty wise in their old age (smarter than a kitten, but not senile yet). They have no interest in jumping in the water. 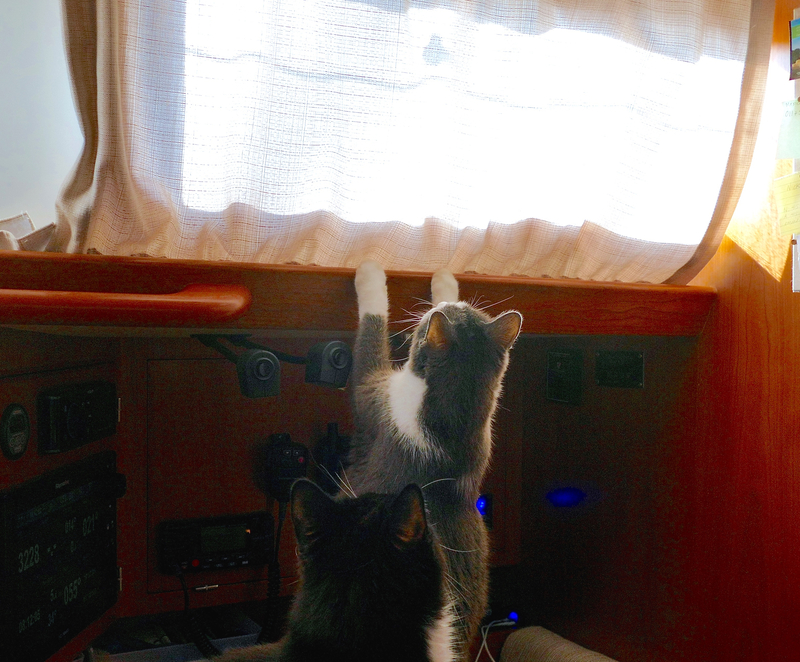 Initially, we would not let them out of our sight if they wanted to stroll on deck. By now they’ve earned our trust (of course we still check on them every couple minutes). 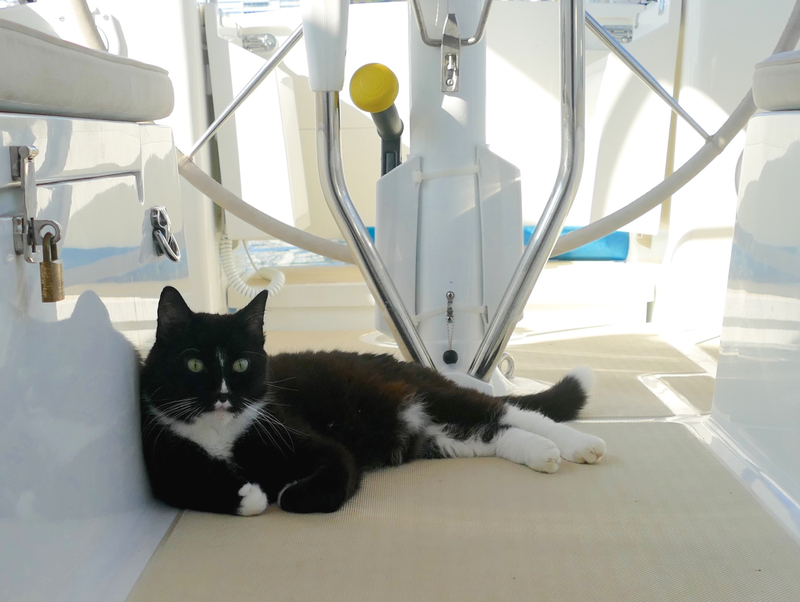 At anchor, they love to walk the perimeter of the boat and look out at the birds and the scenery, plopping down for a rest when the mood strikes. 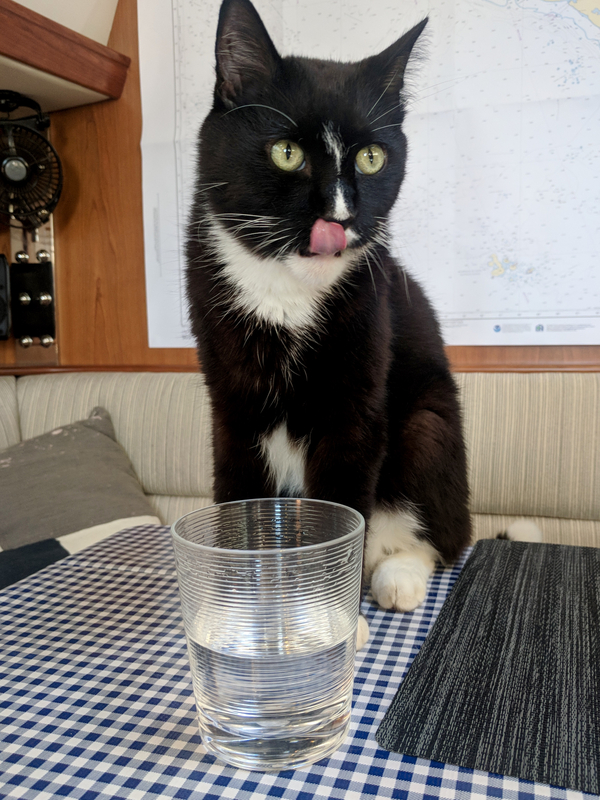 Every morning, Chase jumps into the cockpit after breakfast. He will sit there for hours, watching birds and letting the wind blow on his face. It is very sweet. 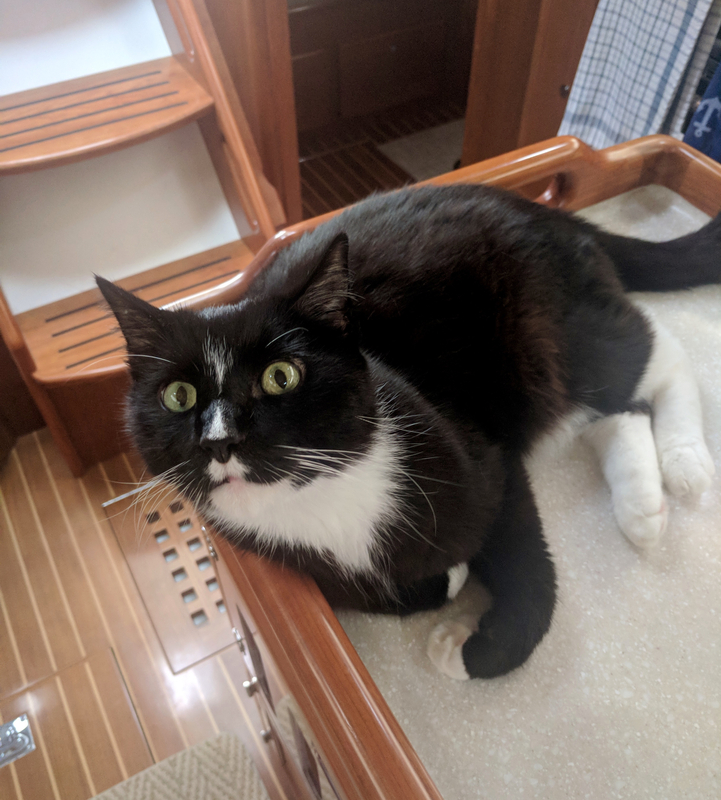 I actually feel bad when we need to leave the boat before 10am, because I like to make sure he has time for his “morning sits” every day. 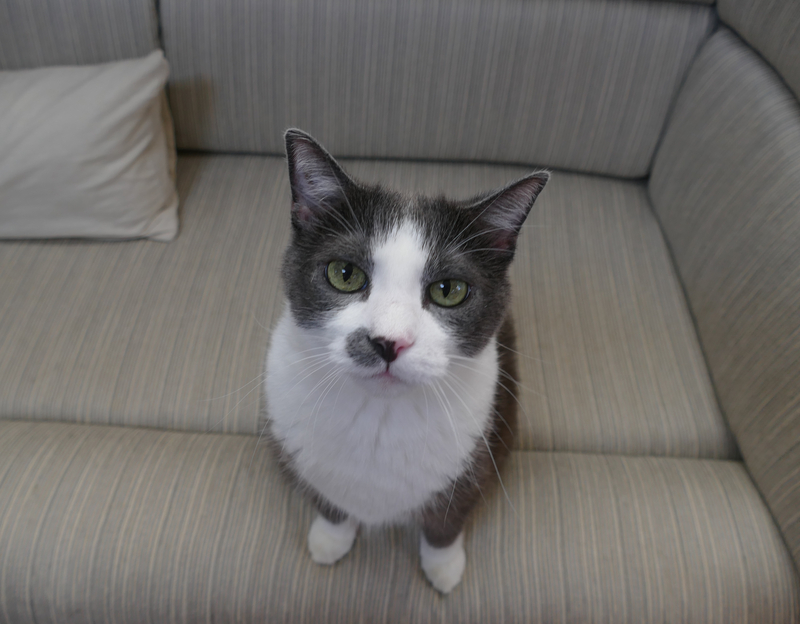 But then, day turns into evening and Chase becomes a different cat. He’s a real nocturnal animal. 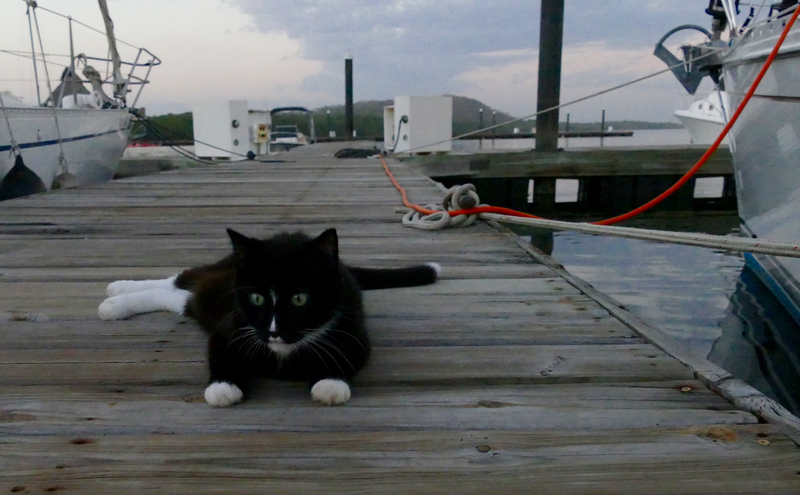 When we are in a marina, this presents a problem, because Chase loves jumping off the boat onto the dock! We’re wise to his moves, so he doesn’t get more than a few feet, and it’s really pretty cute. (Don’t tell him I said that.) He waits until we’re not looking and then BAM! He’s on the dock. What a stinker. Litter is another story. 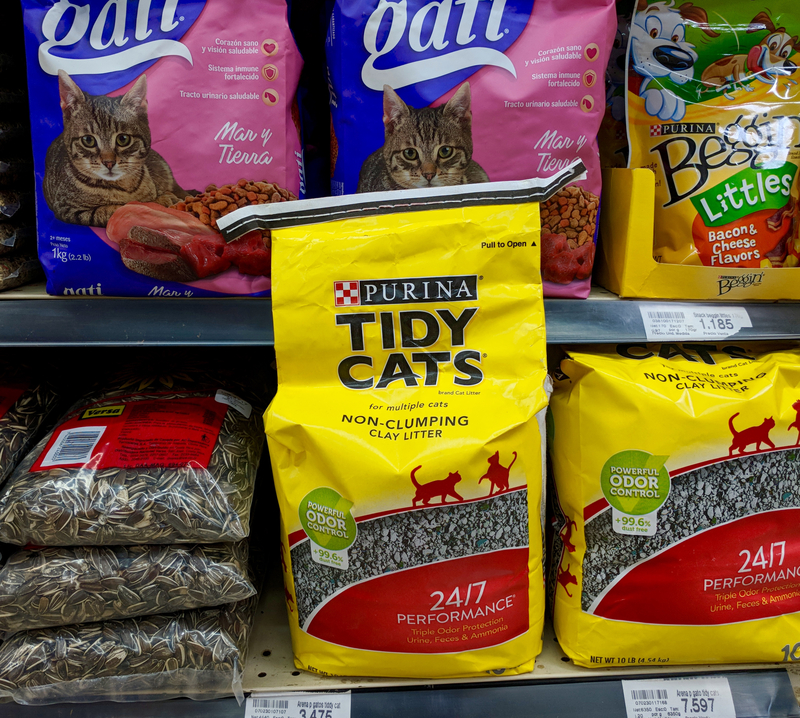 In San Francisco, we used corn-based World’s Best Cat Litter. And you know what? It earned its name! It clumps perfectly, doesn’t smell, and creates very little dust. Mexico and Central American haven’t gotten the memo. We tried one other bag we bought in Mexico and it was far, far inferior. It kicked up dust when I tried to clean the litter box, and had no clumping capabilities whatsoever. Guys, on all of the litter here they actually tout “Non-Clumping” on the bag as if that’s a feature. The humanity! They are not going to convince me with those marketing gimmicks. We are down to our last bag of World’s Best so please keep your fingers crossed for improved cat litter technology in Costa Rica. 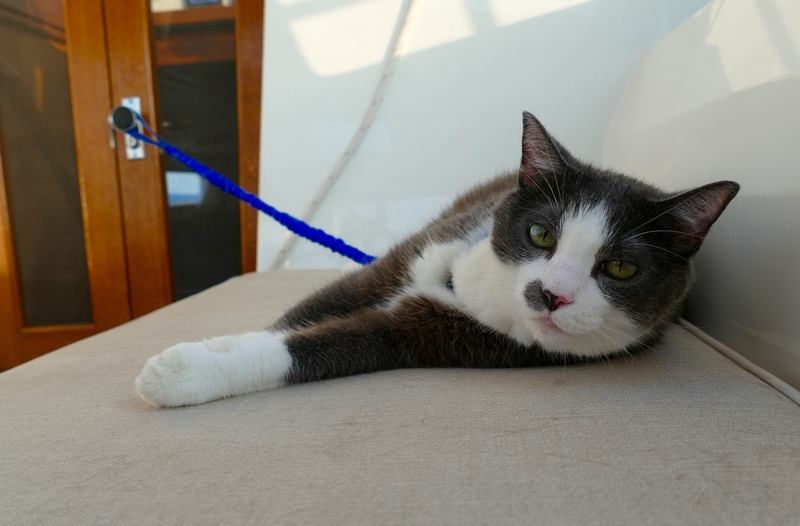 The hardest thing about cruising with the cats, by far, is seasickness when we leave on a passage. If we leave from a marina (where the boat is completely still) into seas where the swell or waves are significant, that’s when they are most likely to be seasick. Leaving from anchor, where the boat is always moving, they tend to be just fine because they are already adjusted to the boat in motion. 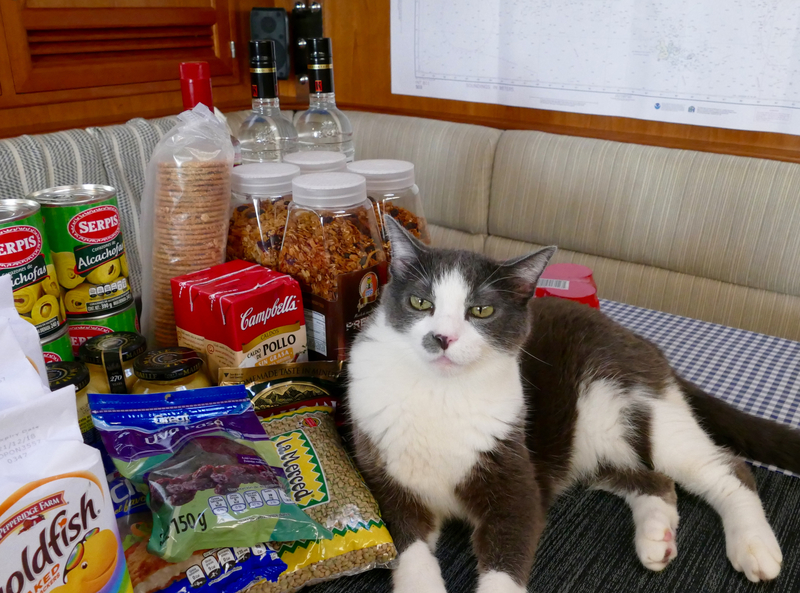 If we’re worried about seasickness, we skip their meal closest to our departure. Not only is easier on the Cat Puke Cleaning Crew (that’s us), but the cats also seem less miserable when they are not heaving an entire meal. (Hope you’re not eating while you read this!) 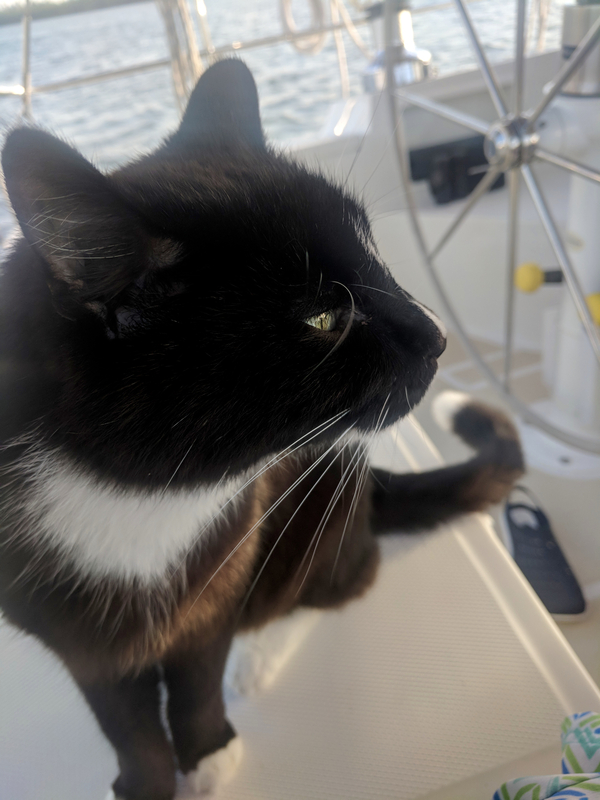 Once they’ve found their sea legs and gotten comfortable, we’ll make up for the lost meal and we are in their good graces again. That’s probably more detail than you wanted. 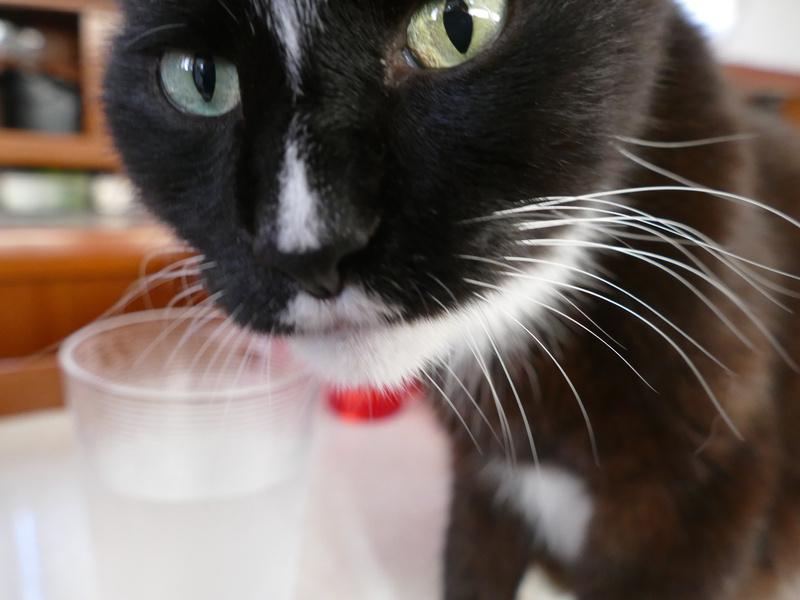 And I know why you’re really here… cat photos!! Hi Humans! I’m Guinnivere, but you can call me Guinny. I’m actually royalty; my formal title is Lady Guinn. 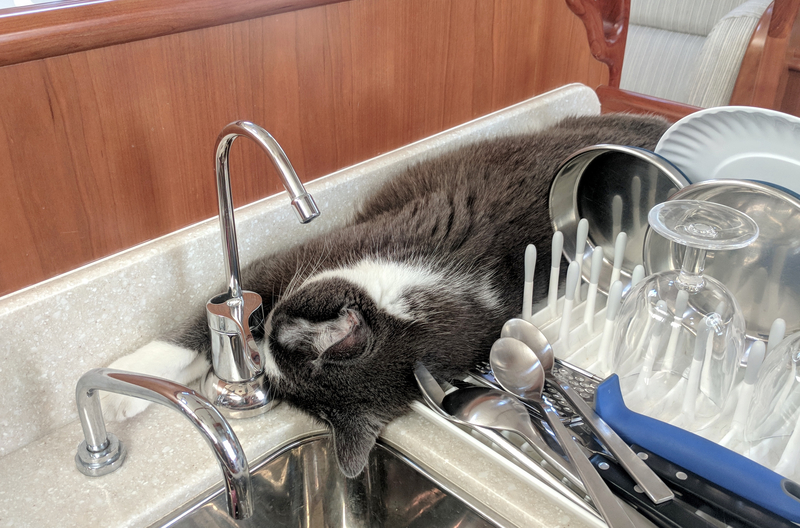 …when he’s not being a crazy cat. 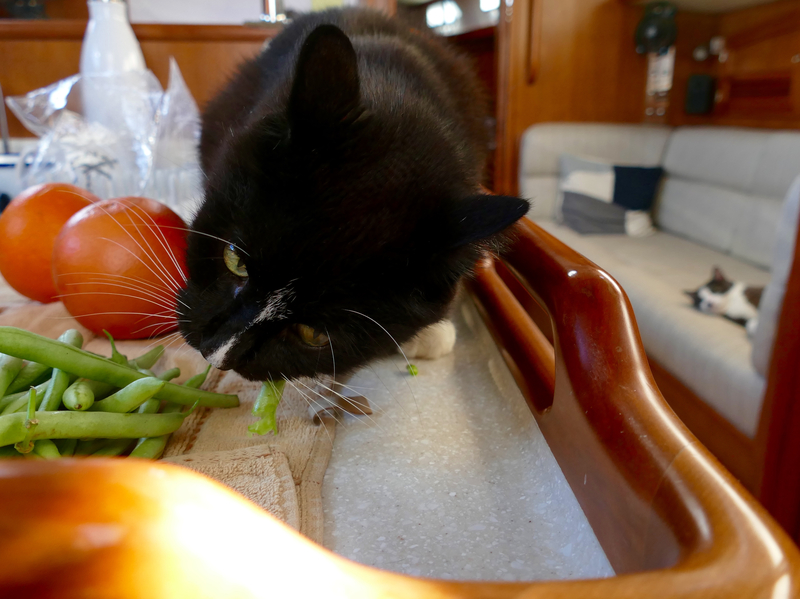 I’ll be straight with you, Chase has a green-bean problem. Can’t get enough of them. I actually feel bad for the humans when they try to cook green beans. Chase never gives up. He’s always trying to snag one more. Me? I prefer packaged goods myself. 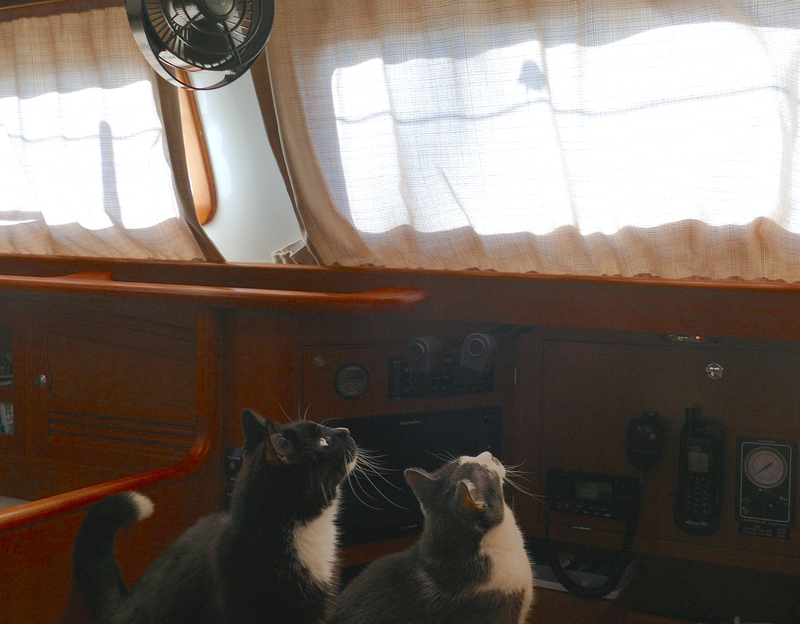 Mornings are usually pretty chill around here, until we see birds. This one time, it was totally crazy, I could have sworn this bird was actually in the boat. But then I learned about shadows. Chase likes to spend most of the morning outside, which I love because then I have the whole place to myself. 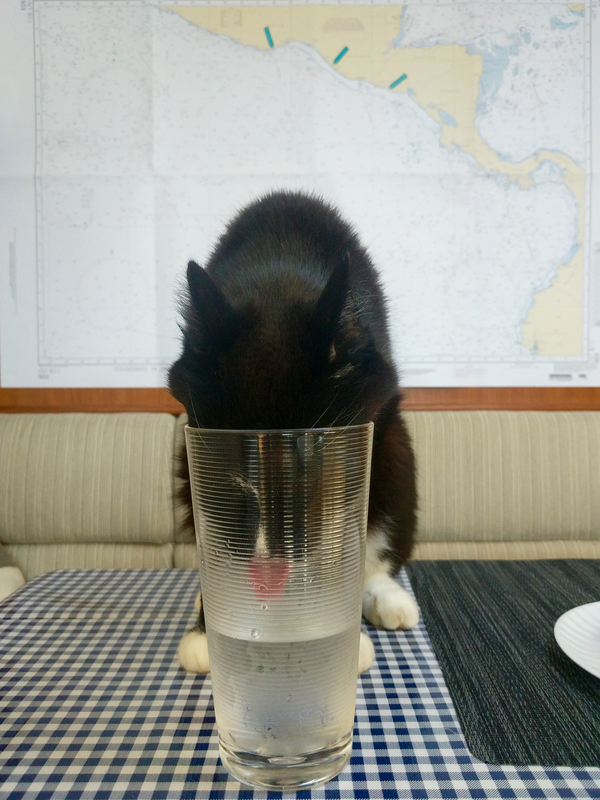 After he’s back, he usually likes to rehydrate. But only from the human cups. Guys, he’s so weird. And the humans don’t even get mad. They just pull out the camera! Here’s Chase really getting in their face to show them who’s boss around here. Chase also really likes reading. Big reader. Huge. 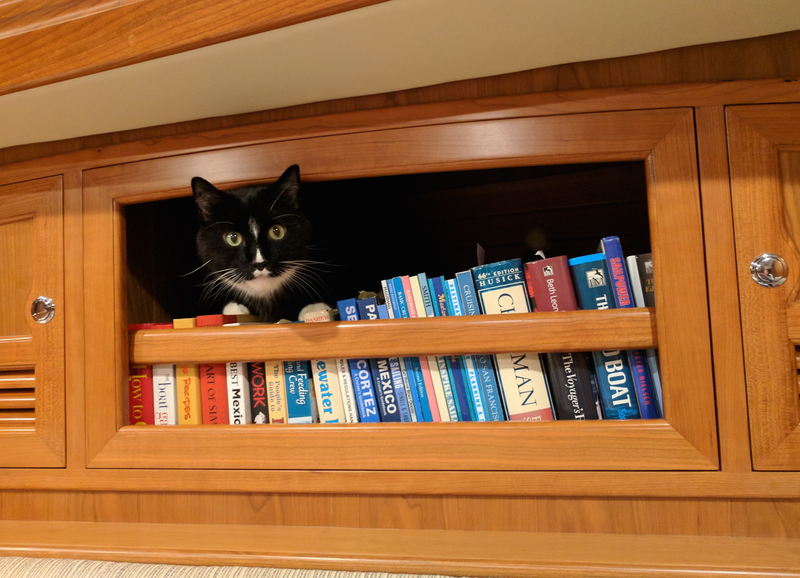 Sometimes he likes to read cookbooks when the humans are trying read them too. 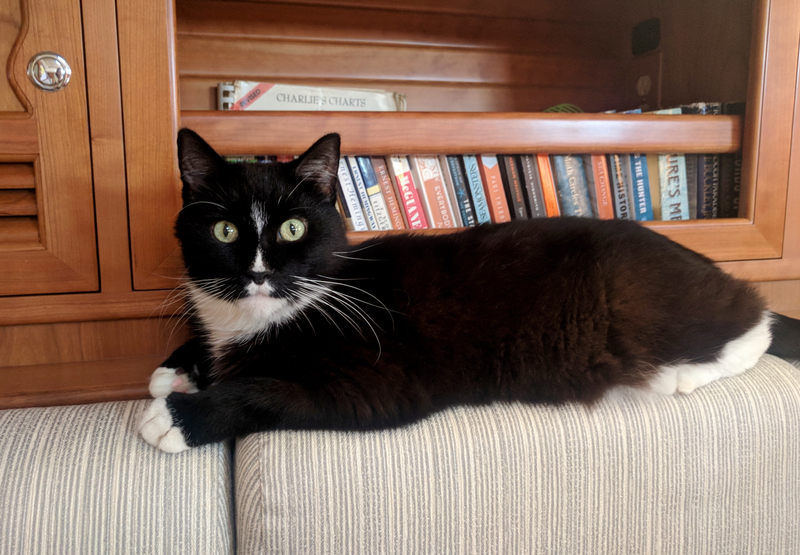 But mostly he likes to sit in the library wondering what he should read next. They won. Defeated this time, but I’m not giving up yet. That’s mostly it, really. 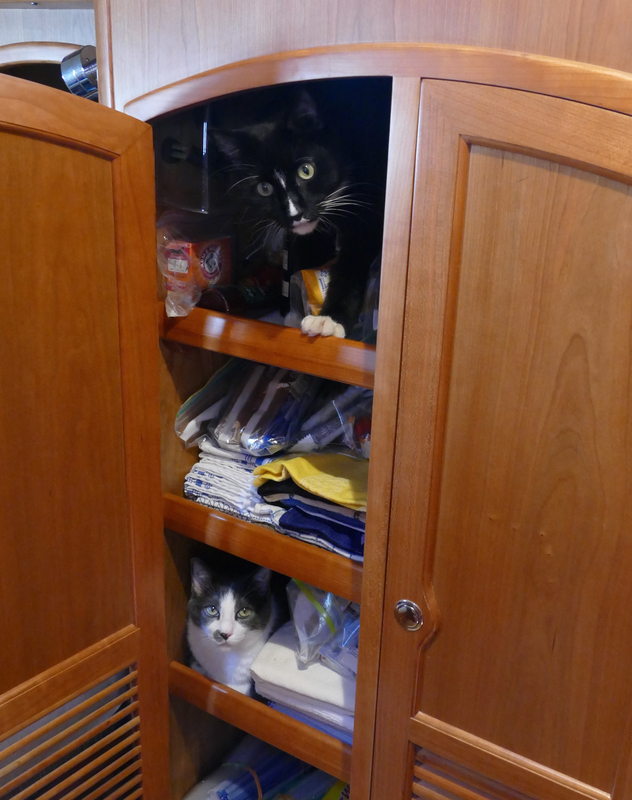 We still amaze the humans by finding new places to sit. Of course I found this spot first, and Chase had to follow me. Writing is pretty exhausting, so I’ll wrap this up now and go back to sleep. Hey, I don’t choose the spots I fall asleep in—the spots choose me. But wait! I can’t end this post with a goofy picture of me passed out! 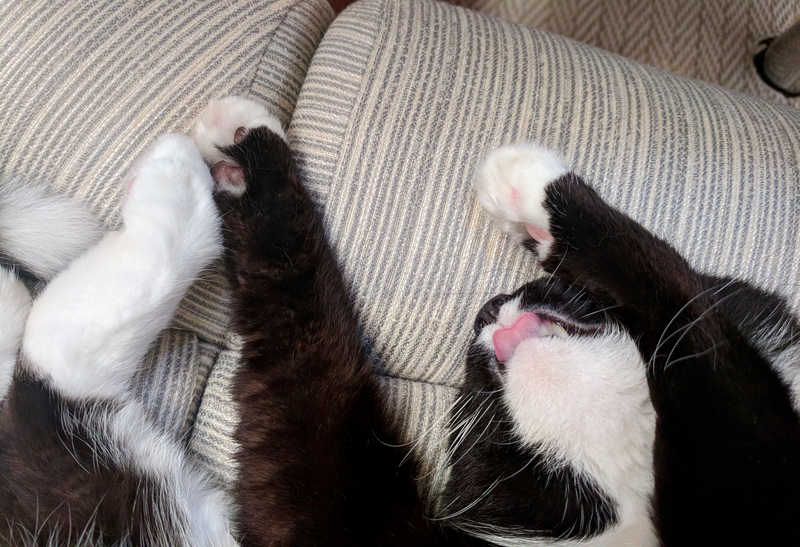 So here’s one of Chase asleep with his tongue out! What a freak! Okay, now that’s it! Thanks for reading and have an awesome Caturday everyone! He’s got birds on the brain, all the time. 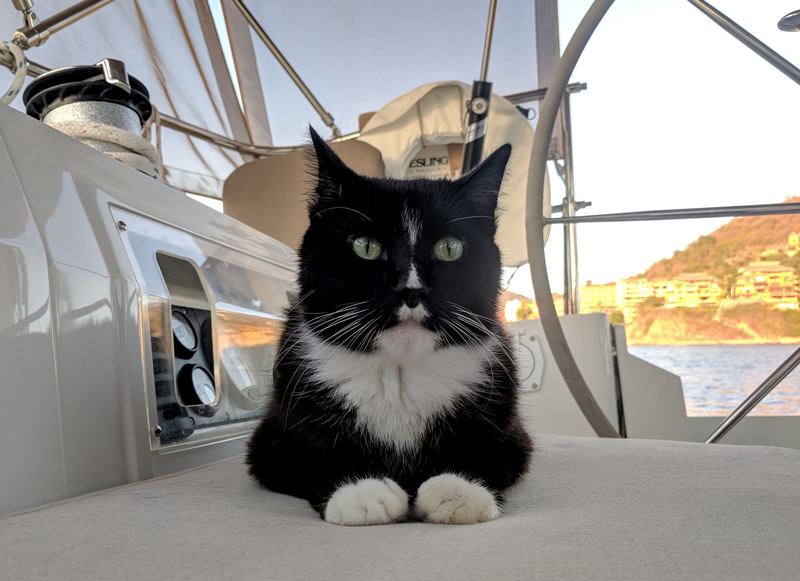 No time to spend in the galley, just meditating and bird watching. Michelle !! I miss you and have been thinking about you and the cats!! Dorna! I miss you too! Thank you so much for saying “hi”. 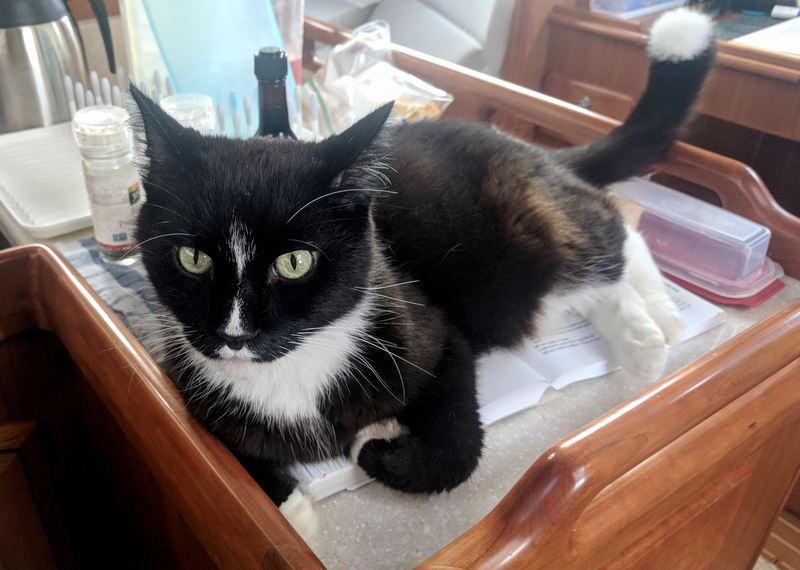 I’m due for a new paw-ticular harbor post. Hope you and all your four-legged animals are well. Mine are all well! Renee and I are always worried about your kitties but after seeing these pictures, I’m so relieved !! Catcher up with your blogposts, very glad that you and John are doing well!